by Dave from The Longest Way Home ~ August 30th, 2018. Updated on February 18th, 2019. Published in: Travel blog » Nepal. Naively I first came across the helicopter rescue scam in 2011. An Italian tourist “suddenly” claimed to have a bad back on his return from Everest Base Camp and was getting a helicopter evacuation. I met him a week later in Kathmandu prancing along the street with a big smile. I asked how he was doing. He grinned at me as if nothing had ever happened. I reminded him about his “back”. He grinned wider. Apparently his guide made sure his travel insurance company “took care of everything”. A one off? No. The vast majority of Nepali guides, trekking agents and tourists in Nepal are not involved in this scam. Unfortunately, it’s the few bad apples which have the potential to spoil the entire crate. In this case the dark crime of fake rescues has the potential to end trekking in Nepal. There are several ongoing investigations into these scams by multiple parties. The investigations into rescue scams in Nepal from all sides have revealed a multi-million dollar fraudulent business. What’s been uncovered is both horrendous, scandalous, shameful and has the potential to turn tourism in Nepal inside out. Full updates on the helicopter scam in Nepal are at the bottom of this page here. What is the Nepali Helicopter Scam? Traditionally it works by trekking companies organizing a helicopter evacuation or rescue for a tourist and cashing in on it. As insurance companies grew wise, it diversified. Today, there are many helicopter scams involving many people and organizations. In the first 5 months of 2018 there were over 1,300 helicopter rescues with staggering claims totaling USD$6.5 Million. One very simple visualization on how this scam unfolds is to know the following. 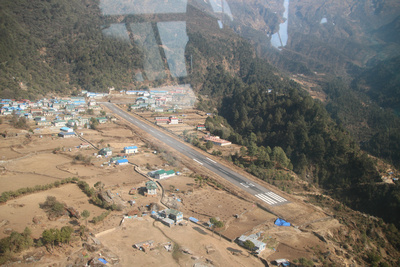 The aviation industry in Nepal has been booming for the past 10 years. Big tour and trekking companies along with some wealthy people with plenty of connections now own other companies that own helicopters. Instantly, we can figure out the potential for profiteering here. These days it can also involve dishonest trekkers from many parts of the world. Evacuation when not needed scam: A trekker gets AMS symptoms or a headache, sprains an ankle or gets an upset stomach. Twenty years or so ago you’d come back down in altitude with the aid of a guide or porter and wait it out or return back to a city. These days many trekkers are likely to hear the words “do you need a medi-vac helicopter, it might be safer”. No time for a full trek: A naive or dishonest trekker with only 9 days to “do” Everest asks how a company can possibly make their dream trek come true so cheaply and with fewer days. “Just make sure you have travel insurance” is the answer given. After they reach base camp, the dishonest wheels of motion take over and the “sick” trekker is brought back to Kathmandu just in time for their international flight home. Two for the price of one: A helicopter evacuation is underway. The “sick” or injured trekker is whisked out from the teahouse after only two days of delay waiting for “weather conditions” to improve despite the bright blue sky. Coincidentally it looks like they’ll be joined by another sick trekker who has also handed over all their travel insurance details. You can be sure, despite only one helicopter being needed, both insurance companies will get large claims. Let me out of hospital: A genuinely sick trekker suffering from AMS (altitude sickness) feels so much better upon coming down in altitude. Helicopter or not they end up in a hospital bed handing over their travel insurance details and passport. They are better, but everyone insists they need more tests to be sure. This goes on until just before their flight home when they are finally released from the $500-$1000 a day hospital. The super cheap trek: A tourist sees a popular trek that’s $100’s cheaper than anywhere else. Bingo, let’s book it and go. The company doesn’t make much from the actual trek fee. At $5,000 – $8,000+ these evacuations are far more lucrative if they can skim 5-10% off a claim. If not, then that last minute helicopter flight scam comes into play so they don’t miss a flight home is a back up scam option. The list goes on. However, those are the most popular helicopter scams in Nepal. In the ongoing investigation something even worse has been revealed. The AFP reported that baking soda was used to give trekkers diarrhea (source). Tourists were made to be genuinely ill so a helicopter evacuation could occur. This is brutally shocking to say the least. Global Rescue, a USA based search and rescue company, made repeated attempts to report the wrong doings of these companies. However many of these companies are well connected and in turn made repeated attempts to have Global Rescue removed from Nepal with counter reports (source). Who is to blame for the helicopter scam? Secondary people to blame are the insurance companies and the regulation of what’s going on. There are actually many people behind all this and to blame for the helicopter scams in Nepal. Currently 15 companies are being charged with being involved. Meanwhile others state it’s just the tip of the iceberg. Guides and trekking agents have been very quiet about the scam for obvious reasons. However, just do an online search for “helicopter scam in Nepal” and you’ll uncover the whole dark industry that’s been going on for years. It’s become so well known that many trekking agents started asking for guides to slow down or stop it before tourists or the media find out. Greed took over and now the whole lid has blown off this scam in a very major way. Just a few months ago Nepal’s Tourism Minister voiced concerns on the scams (source) with an investigation concluding in July 2018 (source). Here is the list of 15 companies that were named and charged with this scam in a 700 page report (source). Alpine Rescue, Kailash Charter Rescue , Mountain Heli Charter Service, Eagle Heli Charter Service, Easy Heli Charter Service, Flight Connection Domestic, Mountain Rescue Service, Himalayan Social Journey Trekking, Swacon International Hospital, Era Health Centre, CIWEC Hospital, Vayodha Hospital, Heli Everest, Air Dynasty Heli Services and Manang Air. It was reported that the initial investigation had proposed that all helicopter rescues be channeled through the Nepali police force. And, that a rescue room be set up for two seasons. Later this was dismissed as more of rumor than actual fact though still printed in Nepali media! However, since then the insurance companies issued a deadline of September the 1st to get this up and running. Interestingly all this snowballed when a group of international travel insurance companies led by Travel Assist started to do their own undercover investigation and on the ground investigation (source) some months ago. The result? Confirmation on a vast number of false and unnecessary helicopter rescue call outs and the threat that if it is not fixed travel insurance companies will no longer issue travel insurance to tourists. Since then, the snowball has garnered international media attention (source). The result? Insider confessions including one pilot who confirmed he only took 3 people who were actually sick all year. An Australian trekker confirms that though she only had a cold, her guide insisted on a helicopter evacuation for her. On the flip side of things are the many tourists to blame for this too. Some are well “aware” of what’s going on. But, the temptation of a “free” helicopter ride is both exhilarating and bold. That’s one thing. The really nasty side to this thing are those tourists who are well aware of what they are planning to do. All this in order to shorten their trek to fit it into their short schedule. Be that as it may, the fact that all the people involved could get away with this for over 10 years shows how deep rooted, morally disgraceful and fraudulent this has been. In a country that prides itself on friendly trustworthy people this has shaken the view point people have of Nepal to its core. All on board … the travel insurance is paying for it so don’t worry … well, actually it is a worry. 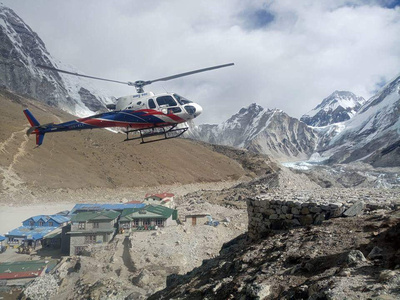 Over the past two years more and more helicopters have been appearing in Nepal. So many in fact that the communities along the Annapurna Base Camp have banned wealthy tourists taking trips their instead of trekking. Helicopter noise was destroying the pleasure of the natural trekking route. Moreover, local tea houses where losing out because “heli-trekkers” were no longer staying overnight. Such an initiative by a real local community has been congratulated. It’s been incredible to listen in on guides talking about helicopter this and helicopter that over the past few years. It seems like more people than ever were being pushed to take helicopter rides than ever. All this along with more helicopter evacuations than ever. Now it all makes sense. I’m very glad that I’ve been overly cautious when giving people the correct advice as I take my time to review trekking companies. Langtang not being safe for solo trekking is one example I still stand by. I certainly think solo trekking is fantastic, possible and great in Nepal. But in some areas a having a guide is simply safer. Getting a good local trekking company is another thing I work hard to achieve. My gut instinct has been confirmed and I’m happy with my review process of trekking agents. I keep a constant eye on who I do review and who gets in. I don’t accept free treks or sponsorships. It means you get a 100% unbiased and genuine reviews in my books and on this website. 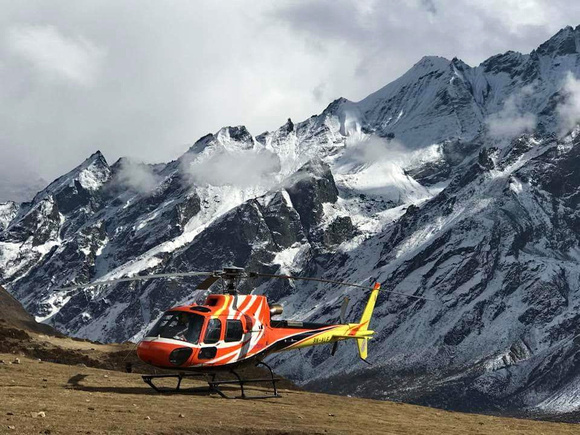 Not a single trekking company charged with the helicopter scam is or has ever been in one of my guidebooks or website – I research them all thoroughly. It goes without saying. If a company is found to be in anyway fraudulent or endangering tourists they do not have chance at being reviewed let alone listed here. I go to great lengths to find, use and review good local companies that provide genuine trustworthy services to tourists. 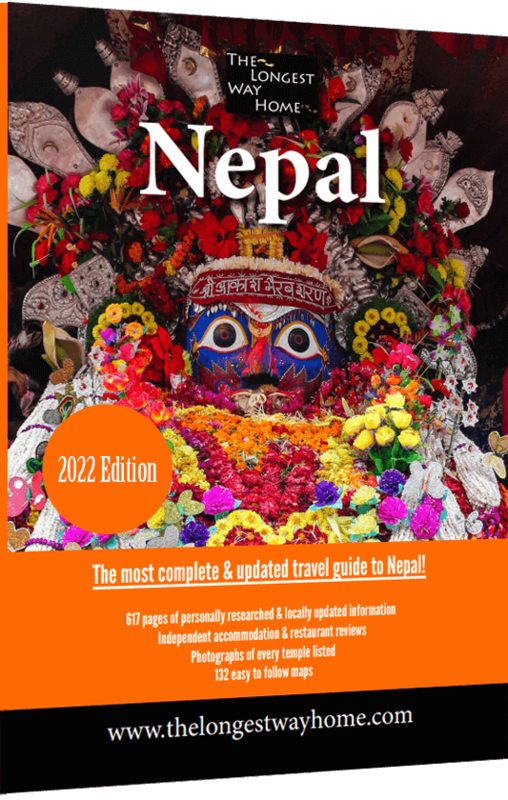 As always, you are welcome to contact me about the trekking guide I do use, but I’d really prefer it if you buy a guidebook to Nepal that contains the contact details of many genuine trekking companies as it keeps all of us honest folk afloat! What’s so bad about cheating an insurance company? Well, aside from the moral and ethical side of things there are plenty of reasons this scam needs to stop. First and foremost think of it like this. A trekker really gets AMS (altitude sickness) or a heart attack somewhere in the mountains yet has to wait. The medical evacuation helicopters are all booked out taking not so sick people for profitable rides. Lives are put at very real risk. Secondly, it’s raising insurance premiums. The problem here is that for many tourists and trekking companies is that this is a one off trip so they have a tendency to brush it off as they’ll never need Nepal trekking insurance again. So, the insurance costs simply move on to new trekkers who pay higher premiums. The cost of insurance keeps going up. The fallout eventually becomes so bad that the cost of getting insurance becomes too much so people don’t go trekking in Nepal. Or at least, the number of trekkers who can afford to go trekking drops. As mentioned earlier, there’s a group of 5 international travel insurance companies who have warned Nepal that if this continues during 2018 then they will no longer issue travel insurance come September 1st. That is a clear warning Nepal should really take note of. It’s not another Nepali style “tomorrow, tomorrow” warning. It’s a very real statement that will stop trekkers coming to Nepal. One would think that the investigation itself would stop these corrupt trekking agencies and guides from making these claims? Nope. The trekking industry in Nepal is decades old and has always followed two seasons. It’s during these two seasons that guides and companies make the most money. They have to squeeze a whole years earnings into just a couple of months. The result? Well, the mentality of make money while you can no matter what it takes is pretty much the rule of thumb. It’s not just helicopters either. Hospitals rake in high premiums from insurance claims. To give you one example. A tourist in Kathmandu fell and needed stitches and a tetanus injection. The premium hospital asked for her insurance details. The cost of the stitches and tetanus injection? USD$500. The tourist was shocked despite having insurance. A Nepali friend took her to a local hospital. The cost? USD $20 total. This is an honest tourist and an honest Nepali hospital. Again, there are many honest people in Nepal. It’s the few bad greedy people that exist everywhere in the world that have caused this scandal in Nepal. They have been outed. Caught red handed. It’s a good time for Nepal to wipe the slate clean and begin the process of insuring tourists are once again treated as “honored guests” and not walking wallets. How to stop the helicopter scam in Nepal? Travel insurance companies have warned trekkers to be aware of the situation. And in 2017 along with 2018 sent their own investigators. The problem boils down to liability. If a trekker is really sick and a insurance company says they are not paying, then they’ll be sued. Insurance companies have gone so far as to tell trekkers that certain companies are not covered. The result? The trekking company changes their name and continues on. Let’s not forget that many helicopters are owned by the same people who own some of these trekking companies. It’s a never ending circle. So, insurance companies have basically said it’s costing them too much so cut it out and prove it or no more insurance. At the end of the day, if insurance companies no longer issue insurance for Nepal next year then everyone will lose out. That’s how serious this has become. Now, it looks like the internal investigation has proposed that the Nepali Police Force will be the ones to arrange any rescues. Thusly an impartial and just organization will be acting as a buffer between the rescue and the insurance companies. Will it work? Will the travel insurance companies accept this? Let’s hope so. Because if it doesn’t work … then it really will end trekking in Nepal. Not all helicopter rides are scams in Nepal. Some are sightseeing, some simply transport goods between villages – but, you should be aware at the very least of a few a bad tour operators doing something else with them. Perhaps a sure fire way to stop this scam is for Nepal to issue its own national travel insurance for trekkers … hmmm. It’s actually not a bad idea if the insurance just covers evacuations and hospital treatment in Nepal. Thereafter an international trekkers own insurance would kick in if they need to be sent home etc. As nobody seems to know what or how exactly the TAAN TIMS card benefits trekkers these days perhaps that $20 can go towards insuring trekkers. Something like this started in Thailand recently for boat trips. Tourists buy 100 Baht wristbands with QR codes for ID and are covered with Insurance (source). Perhaps something similar could be done by a Nepali business? Provide dedicated trekking insurance for tourists. Would it work in reality though? Certainly not if it’s two tiered in pricing like many services for tourists in Nepal. As always any updates to trekking will be updated in the trekking in Nepal section as and when these proposals come into effect. These are administrative changes so trekkers will likely not have to do much as rescues will still be handled at an official level. How to avoid the helicopter scam in Nepal? It’s much the same as the above. 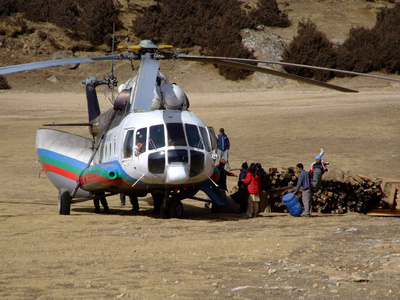 Will the helicopter scam in Nepal effect your planned trek? No. There are only a few agencies and guides doing this and they’ve already been named/charged. It’s highly unlikely that so long as you’ve researched both your trekking company and the trek you are going on that you will even come across this scam. On August 31st Nepal announced new measures to prevent this scam (see below for updates). The vast majority of Nepali guides and trekking companies are honest and good. The problem lies with the few bad ones out there. The ones that are getting away with it and making everyone else suffer. It’s a good thing that an investigation occurred. Nepal is well aware how much the trekking industry means to it and has been proactive in being transparent about this issue. An investigation was started with a 700 page report including proposals to stop any helicopter scams and improve trekker safety. You should always keep your own health safe as a priority. Never doubt the need for a helicopter evacuation if you need one. That’s what it’s there for. A group of international travel insurance companies have now warned Nepal that if it doesn’t put something definitive, transparent and certain in place by the 1st of September they will not issue insurance. This is likely not an idle threat. Nepal is waking up to the very real possibility that its core trekking industry may suddenly grind to a halt. With the Nepali Police Force now being proposed to coordinated the rescues the insurance companies are likely to green light it. What is important now is keeping the wonderful mountains of Nepal safely accessible to everyone while being aware about the few people out there that are profiteering from this scam. Late on Friday 31st August with the international insurance deadline the next day Nepal put in provision a measure to prevent the helicopter scam (source). All of the above came into effect immediately on Friday 31st August with details being sent to the international travel insurance companies and insurance is still being issued. Shockingly, despite all assurances at the end of the 2018 trekking season reports are coming in that none of the above was actually carried out. Invoices shown by trekking companies still show trekkers (and their travel insurance companies) being overcharged for rescues. Profits of USD$500-2100 per flight have been reported. Helicopter companies have stated 489 helicopter rescue flights were reported between September and October in 2018. Most were Everest based. However, airport officials have logged over 1,000 during the same period. 68 were logged during one day alone. Worryingly Nepal’s tourism department stated in the report that only 48 rescues were carried out (source). There is a staggering difference in these numbers. Reports are still coming in of trekkers not getting a rescue unless their agency pays a hefty commission to speed things up. So far the agencies originally named have had no action taken against them. At least one insurance provider has stated that it’s now on the cards for insurance companies to stop providing travelers with insurance to Nepal as they are making a loss and it’s simply not worth it to them. They’ve spent time and money investigating the situation in Nepal but nothing has been done beyond words. Despite repeated warnings from insurance companies and media reports around the world Nepal seems completely oblivious. 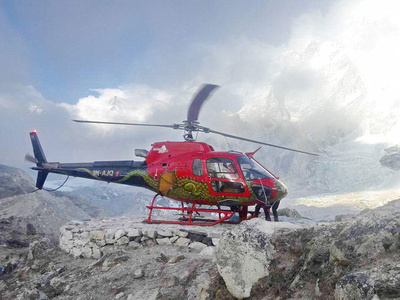 Similarly the “banned” recreational helicopter flights to Annapurna Base Camp still fly everyday (source). One call to any trekking agency in Pokhara will garner you a $300-500 seat for a quick trip. Officially, they are not happening. But you can still unofficially book a one hour round-trip flight and one look at the helicopters landing at ABC high camp tell the real reality much like the rescue scams that continue. When one asks trekking agents who call in rescues the only change has been that some insurance providers now add a $700 excess to a helicopter rescue. The result is the trekker has to pay this and so they are less likely to use their insurance for a rescue. Trekking agents questioned see these certificates and are telling trekkers that the insurance is no good. Despite being valid. Moreover, when asked about the very real possibility of insurance companies pulling out of Nepal trekking agents simply shrug it off in typical Nepali fashion. With literally no change in the situation it’s become a very brazen stand off between Nepal’s ethics and the profit margins of international businesses who have already stated they will pull out of Nepal. These uncertain circumstances only undermine Nepal’s tourism industry and reputation for early next year. On Friday the 25th of January the Nepali Government was given a letter from Jonathan Bancroft (Managing Director of Travel Assist who represents three insurance providers) detailing that if the companies listed against the named companies involved in the fraud were not charged the insurance companies would cease offering coverage for Nepal from February 15th 2019. As a follow-up to Travel Assists accusations Nepal seems to trying to counter Travel Assist stating that rescues were down during the previous autumn peak season of 1,532 to 186 (source). That’s quite a favorable drop. One wonders what would have happened has Travel Assist not initiated their own investigation in the first place. Further to this the Nepali Times is reporting that the Nepali trekking industry has gone into damage control and is trying to counter the negative publicity the scam has caused the country. Unfortunately this counter seems to be personally blaming the people working at Travel Assist. Moreover, similar to previous media claims there’s a renewed focus on trekkers partaking in the scam over companies to blame. Interestingly in regard to trekkers being involved in fake rescues some insurance providers have introduced an excess fee (that’s over the cost of a regular helicopter flight) should a rescue be called. By charging an excess fee these insurance providers have basically eliminated the “cash in” insurance scam some trekkers may have been involved in. Meanwhile in Nepal people are playing the blame game and continuously passing on the responsibility to different departments. On the ground, trekking companies continue to call in helicopters for both rescues and leisure. One travel agency has said they don’t worry about western trekkers as there are enough rich Chinese coming in who don’t bother with travel insurance and pay in cash. It is this cavalier attitude of not accepting responsibility and thinking that Chinese trekkers will support them that has brought Nepal to the brink of a very serious international deadline. Nepal has lofty goals of bring in 2 million tourists by 2020 – something which will not happen if trekkers cannot get insurance. Meanwhile the damage to Nepal’s reputation as a trekking region will be seriously tarnished as people seek out new destinations. For now it’s highly advised that trekkers and travelers to Nepal double down and make sure their insurance provider is still covering Nepal. See below for details. As the deadline set by Travel Assist expired they released the following: The people and companies behind Nepal’s multimillion dollar insurance fraud scam. The article lists 23-brands, under the umbrella of 18-companies which are connected by only 10-people who are involved in 90% of Nepal’s insurance fraud. The compressive article goes through the history of the investigation, the assurances, failures, expired deadlines, threats and indeed the names of those involved from the top down. Travel Assist state they have passed this information in detail on to their clients (travel insurance companies) who in turn are waiting on a response from Nepal. Meanwhile Travel Assist also state they will not deal with any of the companies or people named in the article. Once again the above update has meant that Nepal now knows the insurance companies were not bluffing. There is talk of Nepal’s insurance been moved in to a high risk category similar to Afghanistan or Iraq. The onus has shifted back to the Government of Nepal to respond. The exposure of the helicopter trekking scam has seriously damaged Nepal’s reputation from the top down. Greed, corruption, denial and delay has embarrassed and tarnished the entire country. Where things go from here is solely in the hands of Nepal. There is one choice that has been made very clear. Stop treating tourists like walking wallets and go back to treating them like honored guests. The latter is why people have always visited and want to continue visiting Nepal. People will stopping visiting Nepal if they feel they are either being cheated, involved in fraud or their lives are being placed in danger. Today, Nepal is still open to trekking and travel insurance is still being issued. Insurance is still being issued and treks continue on. For now this means it’s now more important than ever to research your trek to Nepal. The Himalayan mountains are large and vast. It’s not about just getting the cheapest package tour to see them. It’s a proper trek and you need to be prepared! In all cases for tourists wanting to trek in Nepal doing research into your trek beforehand can really make a difference. It’s important to remember that if you are going trekking you will need to state the altitude you are going to and get specific trekking travel insurance for Nepal. To enjoy your trek. Be Smart. Be safe. Learn and read about trekking in Nepal before going. This is a deep shame on Nepal. They depend on tourists, but treated them like this. There is no doubt this has been a complete embarrassment to Nepal. I think many more people knew about this from hotels to everyday people. But they all stayed silent. Yes. Only in the past two years has this scam come to serious light. Before it was mainly rumor. Nobody ever did an investigation. The biggest fear is that had the insurance companies not done their own, then it would likely still be going on. Thank you for writing about this. We trekked in Nepal in 2016 and were asked if we wanted a helicopter to bring us back as were both has headaches. We knew it was a mix of tiredness and altitude, but our guide kept asking if we needed an evacuations and it was no problem to arrange as we had insurance. We actually found the trek great but felt harassed that he wanted us to leave early too! We reported it to the trekking companies head office in Kathmandu but the owner just said the guide was very worried about us and was keeping our safety first and foremost. I don’t know if this was part of the scam, but it was certainly something we felt we should have asked for if we needed an evacuation. We didn’t. And we didn’t need to be asked by a guide who was being very pushy for us to go back early. We simply took some paracetamol and went to bed early. We were fine the next day and kept trekking. Trekking was great. But I would advise anyone to do as is written above and research your guide properly. It’s sound advice. It’s good to hear that you did not fall for this guides ploy. And it’s a terrible thing to hear your guide offering an evacuation instead of coming down in altitude. I sincerely hope that now the lid has blown off this thing and new regulations are in place it will end. Such a scandal. I could never imagine such a thing happening in Nepal. First an earthquake then they repay tourists by scams. Yes, it’s been a shameful, greedy and nationwide embarrassment. I visited Nepal this year and some 15 years ago. There’s greed in Nepal now and it’s sad. More remote treks have wonderful people and if you are lucky you’ll meet great people in Kathmandu. However, from the moment you get off the plane the country is trying to pry money out of your hands. This is a huge change in the countries culture. Unfortunately in many respects you are correct. Money changed Nepal circa 2015 alongside the earthquake. Gone was the generosity you used to see. Thankfully compared to many other places Nepal’s people are still very good. It’s the few greedy ones that have tarnished the countries image. Great article and long overdue. I’ve been in Nepal many times in the past 15 years. The last two times, in 2014 and 2018, I have been made aware of the helicopter scams from stories told by others. One trekker was offered US$1,500 to participate by providing his passport and insurance data. Not sure if he did, but yeah that is crazy!!! I, on the other hand, paid cash $300, to join in others to escape Lukla after flight cancellations in rainy weather. I joined 5 others, who incidentally paid $400 each. So, we chartered the helicopter for the $2,300. Expensive sure, kickbacks involved for the lodge owners who arranged it, possibly, but I failed to see how it is a scam, if we all willingly paid cash without any insurance being involved. Thank Rich. The mere fact you had to pay $300 while others paid $400 shows that there is little regulation there in regards to pricing. Likewise those who were offered money to claim insurance is just insane. Now, there are new regulations in place. Including fixed prices for helicopter flights (updated above), let’s hope it resolves the problem. This has been such a helpful and informative post. I’ve been reading your Nepal guides and find your honesty to one of the most refreshing things I’ve come across when planning my trip. I chose a trekking agent not on the list above too! Good to know that it helped Ray! Wow! Thank you for sharing this, I never knew about it at all. I knew that Helicopter charges are very high but that’s it. However, coming to think of it I guess I also have been a part of this scam. He was from very poor family who lost everything in 2015’s earthquake. We were helping them financially to save their only son. I couldn’t get even one helicopter. This is so sad. I can’t speak for the events that unfolded in this situation. I know weather in Nepal is unpredictable and helicopters can not always fly. Certainly knowing that many large hospitals were also involved in the scam along with rescue helicopters does not ease the burden. I hope the new regulations brought in on August 31st 2018 have put a stop to all this. Enjoyed the read Dave. Quite enjoy this type of post from you. When I was trekking back in 2013 in Nepal I heard stories of this and met a couple of people who were suffering mildly at altitude who were quickly organised a helicopter down. Sad to see how common it has gotten now. It’s in no one’s interest for it to continue like this. Thanks Francis. Yes, it is indeed sad to see how common it became. Totally agree it’s in no one’s interest for it to continue. However, the ones that were doing it, were also profiting. I did not know but I do know that some trekking companies are not honest, which is shame as most people in Nepal value honesty and fairness. I am a solo trekker so would have no contact with any of this. Well, Jonathan as a solo trekker if you (hopefully not) needed a rescue then you’d also have to deal with a helicopter rescue firm. Sadly many withing Nepal are still proposing no more solo trekking above 3000m. Thusly giving profit to trekking companies. Oh my, I’ve never heard of this, so crazy! I haven’t been to Nepal yet but when I do decide to go, I see that I have more work to do than just planning a ‘normal’ trip. Thanks for exposing the dark secret :) I hope Nepal will ultimately manage to take care of the mess! Let’s hope so. Or at least let people know about the situation.